Choose the Manage Business Information command. Display the Business tab, click the Business Tools button, and choose the Manage Business Information command. Quicken displays the Manage Business Information window. If you don’t have a Business tab, either you need to choose View→Standard Menus or you need to choose Help→Add Business Tools. Quicken displays the Add Business dialog box. Enter your firm’s name in the Business Name text box. Optionally, you can also enter a brief description in the Description box, which appears just below the Business Name text box. Use the Owner option buttons, Self and Spouse, to indicate who owns the business — you or your better half. 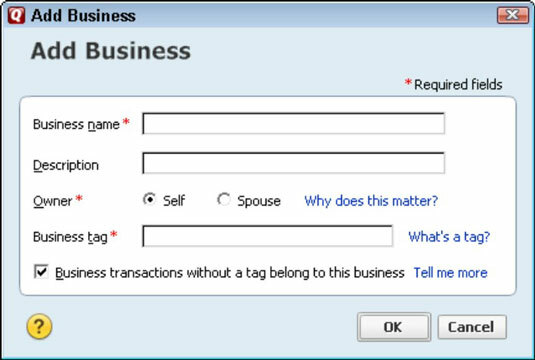 Create a tag for the business. You want the tag to be a memorable yet short acronym or abbreviation you can use to mark transactions as connected to a particular business. For example, say your family does operate two businesses: a consulting business and a landscape design business. You might use the tags “Cons” (for consulting) and “Land” (for landscape design). (Optional) Specify this business is the default business. You can tell Quicken that a particular business is the default business — in other words, that Quicken should assume a business transaction relates to this business unless you tell Quicken otherwise. To do this, check the Business Transactions Without A Tag Belong To This Business box. Quicken returns you to the Manage Business Information window, which now lists your newly described business venture. If you need to add more businesses, repeat Steps 2–7. Click Done to close the Manage Business Information window. The Manage Business Information window provides two useful buttons: Delete and Edit. You can click the Delete button to remove the selected business description. And you can click the Edit button to display the Edit Business dialog box, which allows you to change the selected business’s description.